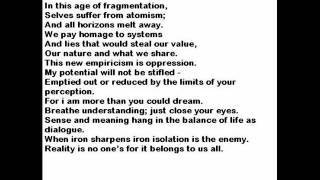 In this age of fragmentation, selves suffer from atomism; and all horizons melt away. We pay homage to systems and lies that would steal our value, our nature and what we share. This new empiricism is oppression. My potential will not be stifled - emptied out or reduced by the limits of your perception. For I am more than you could dream. Breathe understanding; just close your eyes. Sense and meaning hang in the balance of life as dialogue. When iron sharpens iron isolation is the enemy. Reality is no one’s for it belongs to us all.